Mutton Biriyani- The Perfect Recipe for the soul and your family! Mix curd, ginger-garlic paste, raw papaya paste, chilli powder, salt, lemon juice and garam masala as the marinating paste. Marinate the mutton and leave it for at least 3 hours. Heat oil in a pan and add a few pieces of sliced onion; fry until brown. Remove them from the pan and place them separately; these fried onion slices are called ‘Barista’. Heat ghee in a deep bottomed pan and add the remaining sliced onions, green chillies and stir well until onions are golden brown. Add ginger and garlic paste and stir well. Add the marinated mutton and let it cook for 7-8 minutes. Add masalas like Coriander, Cumin Powder and Red chilli powder; mix well. Pour in 3 cups of water, mix and bring it to boil; let the mutton cook in low heat. Further add in tomatoes, salt, Garam Masala and coriander leaves. Let it cook for 15 minutes; the texture of the gravy should be thick. Boil water and add in long basmati rice along with spices- Cardamom, Cinnamon, Cloves, Black Peppercorn, Cumin, Star Anise, Bay leaf and Salt. Add saffron strands, kewra essence and rose water in 1/4th cup of warm milk. In a deep vessel, heat ghee and spread the melted ghee throughout the bottom and sides by rotating the pan. Add a layer of rice, meat, fried onion slices, ghee, and sprinkle saffron water. Continue the layering and make sure the top layer is of rice. Garnish with chopped onion, green chillies, mint and coriander. Cover the biriyani with aluminium foil or dough and close lid, let the biriyani cook in this ‘dum’ for a few minutes without burning the bottom. 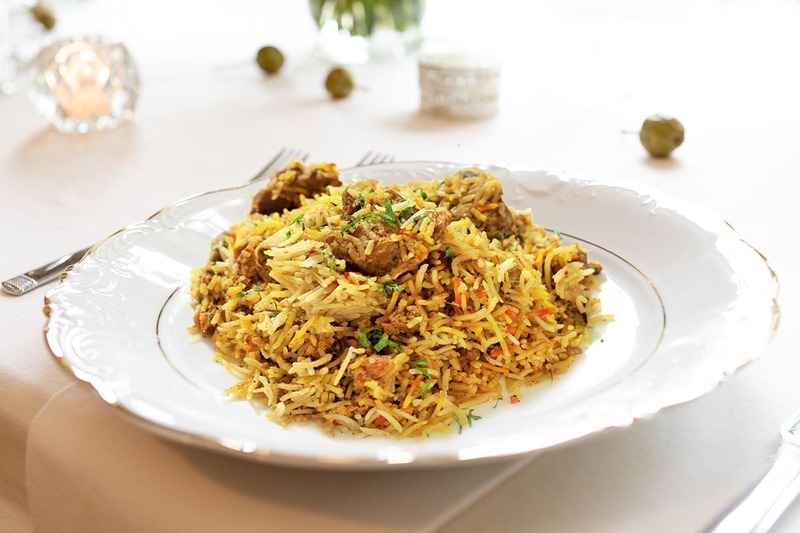 Serve hot and experience heaven in the form of this aromatic ‘Mutton Biriyani’. Loving the recipe but finding it difficult to cook? Order the same from the Masala Box weekends Menu and get a chance to win exciting goodies by placing orders. All you have to do is drop a HI to http://bit.ly/partymb . Previous Previous post: Homemade Nutella for all your cravings- Simple homemade recipe!